First of all, I would just like to say THANK YOU SO MUCH to the staff, teachers, peace buddys, friends and all the people at Ewha that made this summer the best summer of my life. I have always dreamed about going to Korea , but I never thought would be so soon and in one of the best universities in Korea. We started in June , when I arrived at Incheon International Airport , and with all the help that the staff provided, I was able to take the subway and get to Ewha station. It was a really hot and humid day, but anything was a problem. I went inside the university and I saw the most beautiful campus. It was so green; never in my life have I seen that much green ( I live in the desert ). I found the dorms and met my roommate, the best one, I think! I was so lucky that she was a Korean girl! We spent a lot of time together and shared a lot experiences. From the end of June to the first week of August, I studied Korean language and traditional music. My morning class was music, and that was my first time going through so many hills to my class; I almost died on the first walk to find my classroom. It was so far, but by the end of the summer, that same road seemed so short when I walked with some of my friends and made plans for that night and talked about the last day . In music class, our teacher was so nice. She always wore pretty dresses and made the class so interesting . She explained all the types of sounds and different ways to play the 가야금. We learned 4 different songs: Arirang, hwimori, 3 bears and chestnut. We had so much fun, and at the and we had a presentation and wore a hanbok, a traditional Korean dress. The reason why I chose Korean language in the afternoon class was because I did a lot of research and Ewha has an excellent language program. The teaching staff was so helpful; the first day of class, I was nervous and didn’t know what to expect because my knowledge about Korean was nonexistent (or I didn't know a lot of Korean). The teacher adjusted the material to best fit our needs and preferences, and as the days progressed, the incredible enthusiasm that they showed us made everything so interesting and fun. By the end of the summer, we knew the grammar, had endless vocabulary and could read and write basic Korean. All the lessons were centered around cultural themes and useful material that we could use every day, and I think that made us curious and want to keep learning everyday. 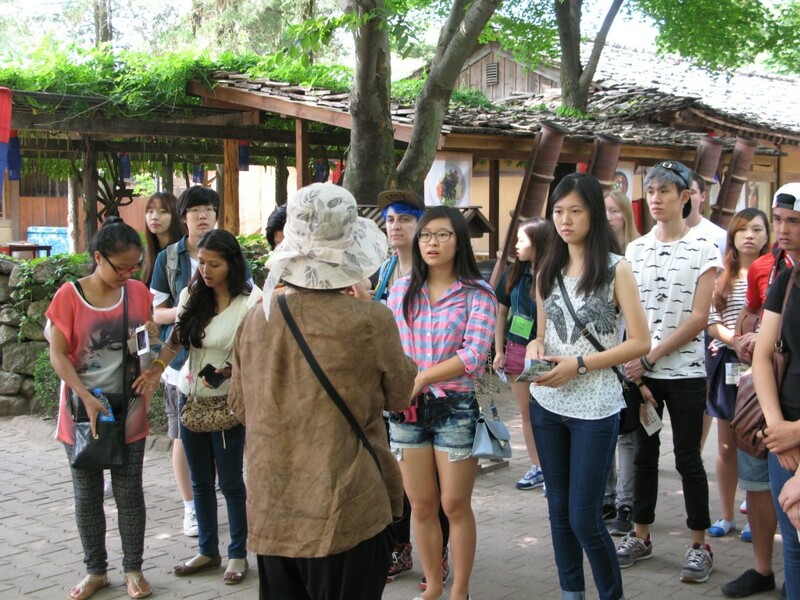 The program really wanted students to go out and see the real Korea and practice Korean with native speakers, so we also had field trips every Friday. The first one we visited had a guide who explained the whole history of the folk village; we also went to Everland and the DMZ , made Korean traditional food like kimchi, and saw the musical performance "JUMP." Every Friday, we had different experiences; we always found new friends, new places , and new things to do. THANK YOU AGAIN for such an amazing summer experience, I think one summer wasn't enough too see all of Seoul , and this summer definitely makes me want to come back again.Maybe I come back home with less money or time to spend the rest of the summer, but I bring form korea , so much friends, greet memories, a lot of souvenirs, and so much learning about my self, I will never regret of choose Ewha, as my house of summer.